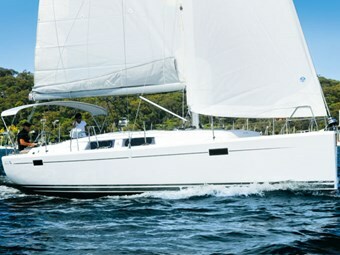 The latest addition to the new Hanse five-series yacht range is the 385. This replacement for the outgoing 37-footer has greatly improved windward performance and brilliant space utilisation, notes Allan Whiting. The model number, 385, suggests a longer boat than the 375, but the former has an overall length of 11.4m – only a shade over 37 feet. However, it's what Hanse has packed into the new boat that justifies its optimistic model number. Multiple choices The 375 had a choice of two interior layouts but the 385 has four. 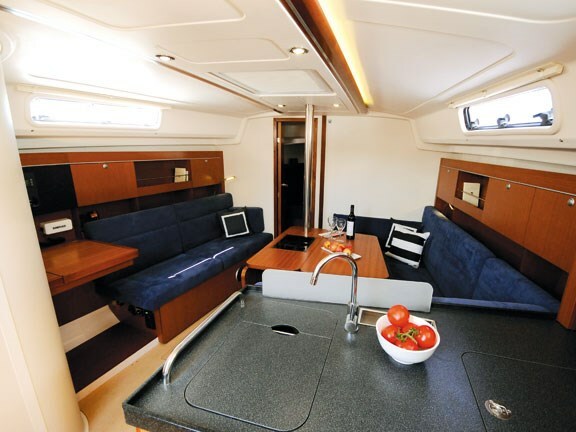 As before, there's a three-cabin or two-cabin, with large aft storage area and also a pick of chart table location, either aft of the dinette or opposite the dining table. However, in the 385 these options can be mixed and matched, doubling the selection. Importantly, the new dinette is pentagon-shaped, not rectangular, taking maximum advantage of hull taper. The settees are arranged around this pentagonal plan and the dining table is shaped to fit so that no one need reach for the table. When the drop side is raised, up to eight people can share the table. Wine storage is built into the centre pedestal and there's an additional bottle rack under the cabin sole, beside the table (Hanse must think all sailors are piss pots!). In the 375, one of our criticisms was an oversized storage area in the two-cabin version – space that could have been allocated to an extended galley. 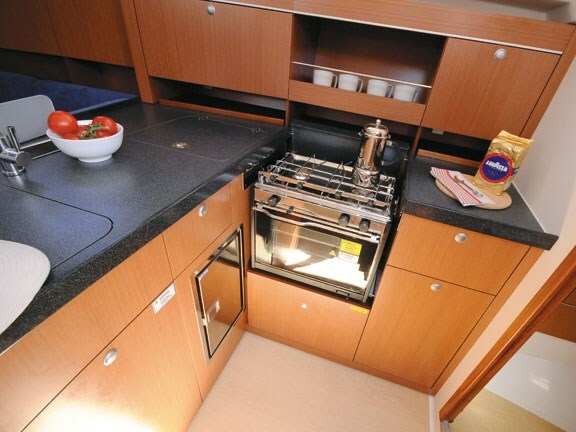 That's exactly what's been fitted to the 385, with the galley extended aft in the two-cabin version, providing more floor area and space for a second fridge. The redundant starboard aft cabin still provides ample storage space. 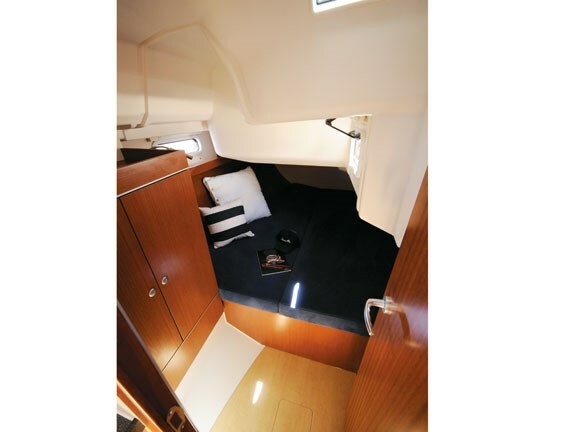 The port aft cabin can be optionally kitted for kids, with a bed that has an athwart-ships-split base and split cushions, so that half the bed can be part-raised, to form a laid-back lounge. Forward of this arrangement is a cupboard that opens to reveal a mounting area for a DVD player/iPad, and fitted with shelving and bins for DVDs, games and other Y-generation electronic essentials. Yeah! Line-up the 375 beside the new 385 and some exterior differences are quite obvious: the 385's twin hull ports on each side and its plumb stem and transom with drop-down swim platform contrast with the 375's single hull ports and more raked bow and stern. The 385's hull ports make a big difference to ambient lighting, when the deck hatch blinds are slid shut to keep sun heat out. A swim platform is a necessity on new boats these days and the 385's lowers easily to make a huge deck extension from where you can dangle your feet in the water. Sockets accept a detachable swim ladder and a port-side transom recess can house a life raft or water toys. When it's time to weigh anchor, the platform rises easily, with gas-strut assistance, and locks securely with hasp and staple pins. However, some deck layout changes in the 385 are less obvious: including full-length toe rails that are almost mini-bulwarks; lidded, teak-faced halyard bins that double as helm seats; and a slope change to the coach house aft moulding, allowing comfortable lounging on the cockpit seats. Also, the deck mouldings have clever recesses that accept infills with cup and plate cut-outs – even a dedicated, non-slip serving tray. 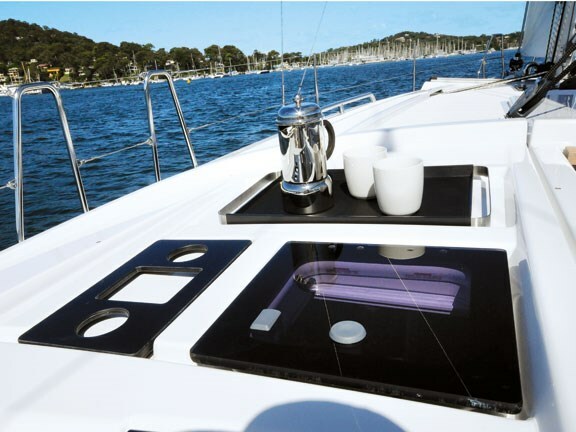 Deck and hull moulding quality is first-class and now the undersides of the chain locker lid and halyard bin lids are gelcoated – no grained surfaces in these often-wet areas to host mould. Dehler direction Hanse didn't take long to adopt Dehler's brilliant companionway door system across the range and the 385 has one of these two-piece drop-down designs. The strongly mounted drop-side cockpit table doubles as a foot brace and grab rail and doesn't crowd cockpit space when folded. The test boat had a composite table surface, but subsequent boats will have teak facings. The table is designed to mount a swivelling chartplotter. Revised dynamics The 385's hull length is actually 350mm shorter than the 375's, but a new plumb stem means that all-important waterline length has gone up, from 10.06m to 10.4m. Stem and stern are taller in profile, so the hull has less fore and aft rocker and a longer amidships flat section. At first sight, the 375 and 385 have identical rigs and sail plans, but detailed inspection reveals subtle, yet important changes. What remains constant is a 9/10ths rig with twin swept-back spreaders; cap shrouds and lowers leading to hull-side chain plates; self-tacking jib arc-track, with mid-mast sheet layout; mid-boom sheeting with twin cabin-top blocks; tackle-adjustable backstay; and fully-battened mainsail with two reef points and lazy jack boom bag. Sail area, with a standard self-tacking jib, is up from 71m2 to 74m2, but this has been achieved with a mast height above the waterline that is almost a half-metre shorter at 17.3m. The 385's mast base is some 150mm farther aft than the 375's and the boom is lower. Mainsail area is up from 42.5m2 to 44m2 (3.5 percent increase), while self-tacking jib area is up from 28.6m2 to 30m2 (a five percent increase). These subtle dimension differences between the new 385 and the 375 suggest a positive effect on sailing performance, producing less heel and more power. Performance and handling Hanse hasn't yet adopted simplified engine controls, so the starting and stopping procedure can fool the uninitiated. The engine is quieter than the engine-bay blower outlet in the cockpit – warm airflow is a bonus – so it's difficult to know when the engine is on or off! Incidentally, the 385 has twin engine room blowers, one sucking and one pressuring, for optimum airflow. Furlex jib roller furling unwound a multipurpose headsail made from heavy cloth that looked like it could handle 25kts without trouble. It wasn't the ideal sail for the prevailing 7 to 10-knot easterly breeze, but still we managed 5.8kts upwind in the 10-knot puffs. The test boat bristled with power winch options, including duplicated control buttons at the starboard steering station. The new Harken primary and secondary sheet winches were reversing types that we haven't used before. The control buttons can be set for single speed and reverse – power in and out – or for two-speed, inward power only. When we pointed the Hanse 385 upwind it was obvious that the new mast disposition and sail plan have transformed the self-tacking-jib boat. When we've tested Hanses in the past, we've always had to ease some mainsheet when close-hauled, to prevent the big sail overpowering the little one and giving too much weather helm, or stalling the boat. Hanses always felt better to us with sheets eased slightly, compromising pointing ability. The 385 changes that situation and it's now our favourite boat in the Hanse range – thus far in the five-series programme. Even with its heavyweight 94 percent jib the 385 pointed well in light air and footed quite happily with a Beneteau 36.7 that was club-racing beside it. Two-sail reaching and running was also better balanced than with previous Hanses, because the main didn't overpower the jib so obviously. 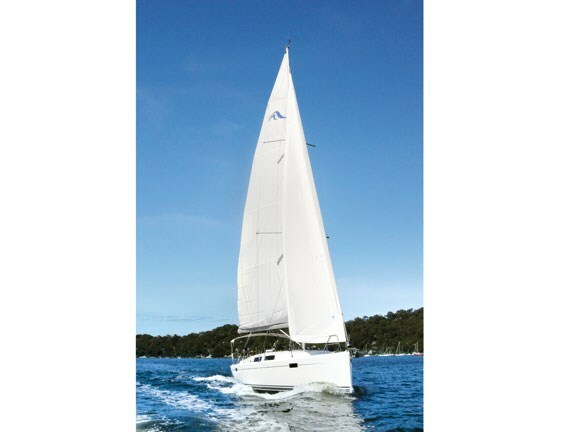 With a well-sheeted, 105 percent headsail the 385 should embarrass some racer/cruisers, we think. Optional headsail tracks mount on the coach house roof, improving sheeting angle and keeping the side decks clear of tripping hazards. The 385's bow fitting extends beyond that of the 375 and comes with a tack ring for a gennaker. This mini-bowsprit looks long enough to allow gennaker gybing between forestay and luff tape, where on the 375 outside gybing was necessary – with the attendant risk of losing a sheet under the boat. At Hanse, the products just keep getting better all the time – keep it up, boys and girls! For more information on pricing, details and availability contact Tony Newmarch, ph 09 413 9465 or visit boatsforsalenz.com.